Newton Johnson in the Upper Hemel-en-Aarde Valley has made quite a name for itself with the Burgundian varieties of Chardonnay and Pinot Noir but what of its Rhône-inspired blend called Granum? The current-release 2014 vintage is a blend of 84% Syrah and 16% Mourvèdre, fermentation occurring spontaneously and involving some whole bunch while maturation lasted 12 months in a combination of 228- and 500-litre barrels, 29% new. 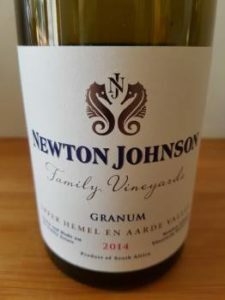 The growing season was reportedly “difficult” due to rain (130mm on the 16 November 2013 initiating the first infections of downy mildew ever in the area) but the Newton Johnson seemed to have brought their usual deftness of touch to bear and a very pleasing wine has resulted. On the nose, some floral perfume and scrub-like notes before black fruit, earth and spice. Not quite as meaty perhaps as previous vintages. The palate, meanwhile, is relatively rich and full with lovely juicy fruit, fresh acidity and fine tannins. Wine Cellar price: R250 a bottle. Next articleMichael Fridjhon: Why isn’t SA doing more about leaf-roll virus?